Events for Teens at the Franklin Library, 1314 E. Franklin Ave., Minneapolis. For more info call 952-847-2925. Dec. 1-Feb. 23: Game On! Gaming Tuesdays from 4-6 p.m. For teens in grade 6 and up. Play PS2 or Wii games at the library! Grab a friend, bring your favorite board or card game, or play ours! Dec. 2-Feb. 24: Game On! Gaming Wednesdays from 4-5 p.m. For teens in grade 6 and up. Play PS2 or Wii games at the library! Grab a friend, bring your favorite board or card game, or play ours! 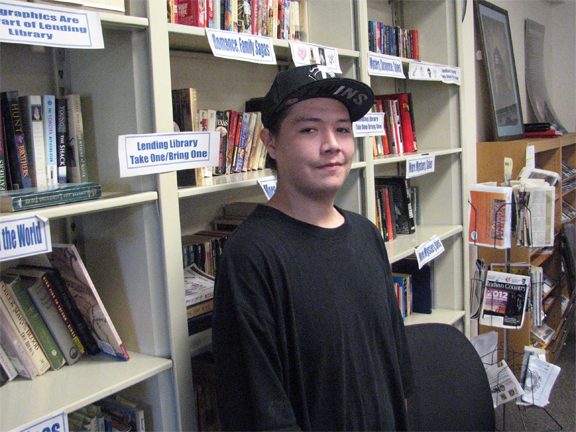 Dec. 2-Feb. 24: Teen Center Reading Club. Wednesdays, (except Jan. 13), 5-6 p.m. For teens in grade 6 and up. Come get cozy! Stretch out on the couches, chairs, or floor and settle in to read aloud or just listen — books, short stories, current events, it’s up to you. No need to read anything ahead of time. Dec. 3-Feb. 25: Design Club. Thursdays, (except Dec. 24 & 31) from 4-6 p.m. For teens in grade 6 and up. Get creative! Design and take home T-shirts, posters, jewelry, magnets and other creations. Check out the posters at Franklin Library to see what project is coming up! Dec. 8-Jan. 5: Tronix Team. Tuesdays from 6-7:45 p.m. For teens in grade 6 and up. Learn basic circuitry as you modify a regular lunch box into a fully functional boom box with MP3 player. Learning never sounded so good! Dec. 10, Jan. 7, 21, Feb. 4, 18: Group Games. Thursdays 6-7 p.m. For teens in grade 6 and up. No consoles needed! Learn social games designed for large groups of all ages: Charades, Wink, Mafia, Whiz Bam, Thumper, Taboo and others. Sure to make you laugh! Dec. 10, Jan. 7, 21, Feb. 4, 18: Music Listening Club. Thursdays 7-8 p.m. For teens in grade 6 and up. Listen to the sounds of Kanye West, Mos Def, NAS and local artists such as Desdemona, Brother Ali and more! Focus will be on the lyrics, reading them as poems and listening to the way they’re recited through the songs. Dec. 17, Jan. 14, 28, Feb. 11, 25: Movement and Dance Studio. Thursdays, ; 6-8 p.m. For teens in grade 6 and up. Time to move the furniture aside and practice dance moves, learn new ones, do yoga, create choreography and lots more! The Indigenous Chamber of Commerce invites you to their 3rd Annual Holiday Party at the Fine Line Music Cafe. Staring Jackie Bird, Night Shield, Moondogs 88, and Wain McFarlane. Cover charge: $5. At the Fine Line Music Cafe, 318 First Avenue, Mpls. 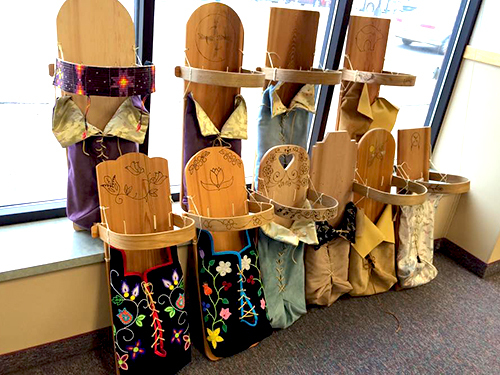 The MN Indian Women’s Resource Center will hold a vendors day for your holiday gift giving. Native vendors, the 2nd annual Native Blends Café Coffee and Bake sale, and an Indian Taco Sale. The Taco sale starts at 11 am till gone. $5 a Taco + .50¢ for a drink. Limited space is still available for vendors. Vendor Day will be held from 10 am to 2 pm. If your interested in setting up shop please call Linda Eagle Speaker at 612-728-2012. MIWRC, 2300 15th Avenue South, Minneapolis, MN 55404. The Bois Forte Urban Office in Minneapolis has been chosen as a recipient for the Toys for Tots program. Tribal members residing in the seven county (Anoka, Carver, Dakota, Hennepin, Ramsey, Scott and Washington) area can contact the Urban Office for intake information, at 612-871-6618 or go to Bois Forte websites Urban Office page. Deadline to sign up is no later than December 14th at 4:30 pm. The Minnesota Humanities Center will conduct a two-day workshop addressing the literary traditions and contributions of American Indians with an emphasis on Minnesota tribes and authors. This workshop will focus on three themes: history of the literary tradition; how literary traditions change based on space and place; and contributions of American Indian traditions to Minnesota and American culture. Participants will read and discuss cultural and literary texts addressing the workshop topic. Hands-on activities will allow those in the workshop to deepen their understanding of the central role of literature in American Indian traditions. Group projects will give participants the time and support to discuss how new knowledge of American Indian literature might enhance what they already teach, how to incorporate the new material into current lessons, and how they present this information in the classroom. Participants will have access to new resources, materials, and tools to help improve student learning in the classroom. Day 1: 10:00 a.m. – 5:00 p.m.; Day 2: 8:30 a.m. – 3:30 p.m.
Graduate credit will be available through Hamline University for an additional fee of $119. Intended Audience: Grades 6-12 educators. Presenter: Robin Nelson and Heid Erdrich. Fee: $135; includes breakfast, lunch, and break service both days, along with materials and resources. Overnight accommodations are available on January 13 for an additional $50. You must reserve an overnight room on the registration form. Contact Thien Nguyen August at 651-772-4254 or email: thien@minnesotahumanities.org for registration questions. Contact Mallory Wessel at 651-772-4252 or email: mallory@minnesotahumanities.org for more program information. The National Museum of the American Indian’s (NMAI) Indigenous Contemporary Arts Program offers support to a wide range of arts activities with the goal of increasing the appreciation of contemporary Native American arts. Through the Exhibitions and Publications initiative, the Indigenous Contemporary Arts Program provides grants of $7,500 to $15,000 for exhibitions, installations, publications, and critical writing which interpret and present the work of contemporary Native visual artists to the public. At least one-half of the proposed project team must be Native American or Native Hawaiian. Eligible applicants include community art centers, artist-run or nonprofit galleries, museums, arts organizations, and education-based organizations, such as college or university galleries or museums. The application deadline is January 15, 2010. Visit the NMAI website to review the application guidelines at: www.nmai.si.edu. The Minnesota Swarm Professional Lacrosse Club, invites everyone to this great event to educate Swarm fans, not only about American Indian heritage, but about the origins of the sport of lacrosse; it’s a Native American sport! Some of these events include: Elder Jerry Dearly will bless the field before the game; Native American dancers and drum group will perform in the concourse before the game, and will be on the field during a special pre-game ceremony as well; Jerry Dearly will also be the MC; Indian Honor Guard will march in and post colors during National Anthem; Oneida and Menominee tribes in Wisconsin will send players to demonstrate a traditional lacrosse game at halftime; With all tickets sold, a portion will be going back to the MAICC to support Native American businesses. There will also be a special ticket donation program – every organization that buys 50 tickets, the Swarm will donate an additional 25 to St. Paul/Minneapolis Public Schools so that children and families, who wouldn’t be able to otherwise, can come enjoy this great event as well. Call Tom Nemo at 651-312-3461 or Brett Miller at 651-312-3494 for additional info. First Nations Composer Initiative (FNCI) is hosting a special concert benefiting our Common Ground program at the AVALON theatre (In the Heart of the Beast Theater). Headlining the concert is world renown Native American flutist, Carlos Nakai with cellist Dawn Avery. Opening the evening’s concert is Mitchell Walking Elk, Hok-a-hey and the Oshkii Giizhik singers! Western Highways: Journeys through Space and Time (42nd Annual Dakota Conference on the Northern Plains) is asking for proposals. Examine paths, trails, roads, and highways that crisscross the expansive Northern Plains and their impact on the lives of indigenous and immigrant peoples. Travel by foot, horse, cart, wagon, stagecoach, bicycle, motorcycle, and automobile—”from moccasins to motorcycles”—will be considered, but also spiritual and metaphorical road journeys. Send 1-page paper or session proposal with title, brief description, and biographical sketch, along with presenter name, address, phone number, and e-mail address. Authors of new books (since 2008) and/or recent books fitting this year’s theme should request and return an application form to be considered for invitation to the conference autograph party. • The Dakota Iapi Continuing Education Student Scholarship is a financial aid program for continuing education (non-degree seeking) students at the University of Minnesota who demonstrate dedication to learning and/or teaching the Dakota language. Selection is based on evidence of commitment to learning the Dakota language and to using his/her education to the benefit of the community, with preference given to students of Dakota, Lakota, or Nakota heritage and parents of children in a Dakota language immersion program. Scholarships cover the tuition of one Dakota language (DAKO) course per semester for up to four semesters. Recipients must maintain at least a 3.0 GPA in order to keep the scholarship. • The Wahpetunwin Dakota Iapi Full-Time Scholarship is a financial aid program for full-time U of MN degree-seeking undergraduates who demonstrate strong dedication to learning to speak and teach the Dakota language. To be eligible, students must have submitted the Free Application for Federal Student Aid (FAFSA) and be admitted or pending admission to an undergraduate degree program in American Indian Studies at the UofMN-Twin Cities campus. Selection is based on evidence of academic promise and commitment to learning to speak and teach the Dakota language and to using his/her education to the benefit of the community, with preference given to students of Dakota, Lakota, or Nakota heritage, those who demonstrate financial need, and parents of children in a Dakota language immersion program. Scholarship awards cover students’ tuition and fees for two years. Recipients must maintain at least a 3.0 GPA in order to keep the scholarship. For more information on these scholarship opportunities, visit http://amin.umn.edu/scholarship/ or contact Beth Brown at email: brow0857@umn.edu, or by phone at 612-624-8217. Dakota Language Table at Anishinabe Academy. Families and students of all ages, at any language levels are welcome and encouraged to join at any time. Runs thru June 8 Monday evenings: 4:00-5:30 pm. Anishinabe Academy, Room 218, 2225 E. Lake St., Mpls. Potluck dinner. Circle Activities: For more information, contact Beth Brown at 612-624-8217 or email: brow0857@umn.edu. University of Minnesota. Ojibwe Language Table. Bring your children, ages 3-5 years, to participate in free Ojibwe or Dakota language immersion classes five days a week. Mon.- Fri. from 10 am-11:30 am. Neighborhood Early Learning Center 2438 18th Ave. S., Mpls. FMI: 612-721-4246. Overcomers Outreach Ministries Inc. sponsors a weekly “Life Recovery in Christ” Bible study and discussion group every Wednesday starting Sept. 16. Classes are targeted for individuals in Recovery or struggling through addiction and out of control living. Family members and friends welcome to attend. Topics include characters of the Bible and their life struggles, challenges and victory over adversity. 6:30 to 8:00 pm. 2020 Bloomington Avenue South. Call Bruce Olson for more info, at 612-480-7110 or email: bolson431@msn.com. Provides access to experienced, professional phone counselors who are waiting to help smokers quit. Free. The following organizations provide culturally specific cessation services: Wiidoowkowishin QUITPLAN Center at Fond du Lac serves the American Indian community at Fond du Lac Reservation and in Duluth; QUITPLAN Community at Pillsbury United Communities serves the Chicano Latino, African American, and other diverse communities. Call 1-888-354-7526 for a counselor. QUITPLAN Helpline: M-F: 7 am. -10 pm; Sat: 8 am. – 5 pm. ; Sun: 10 am.- 4 pm. Strong Hearts Living Life to the Fullest Women’s Support Group. Confidential, safe and supportive environment to discuss issues regarding experience with sexual and or domestic abuse, and prostitution. Tuesdays 2:00 pm-3:30 pm. Light refreshments. Walk-Ins and referrals welcome. FMI, call Aida Strom at 612-728-2028. MIWRC, Room 118, 2300 15th Ave. S, Mpls. Individuals and families who would like support in maintaining their sobriety through a culturally based program are invited to this support group which uses the White Bison approach to a healing journey. Division of Indian Work, 1001 E. Lake St., Mpls. Contact: Cheryl Secola at 612-722-8722 x 399, or Natosha White at 612-722-8722, x 392. Women Standing Together: On your journey to recovery, welcome to our Talking Circle of Hope. Walking through the Healing 12 Steps of Sobriety. Held weekly on Tuesdays from 4:30 to 5:30 pm. MIWRC, 2300 15th Ave. So., Minneapolis. For more info, call 612-728-2000. 7:00 pm every Tuesday at the Minneapolis American Indian Center Auditorium, 1530 E. Franklin Ave. Mpls. The first Tuesday of every month includes a speaker and a pot luck dinner. Everyone welcome. Intermedia Arts has free after-school media classes for youth ages 11-18. Youth can; learn web and graphic design, photography, animation, create a weekly TV show, write, direct, and produce independent films. • OUR TURN is a show made for youth, by youth (ages 11-18). Choose your own subject matter, write your own scripts, conduct interviews, operate the cameras and edit your own story segments. Our Turn airs every week on Channel 17 in Minneapolis and Channel 16 in St. Paul, and is available for viewing online. Workshops held 4-6 pm, Mon-Thurs (ongoing), at El Colegio Charter School, 4137 Bloomington Ave S, Minneapolis. • MIXED VISIONS is an online gallery featuring youth-created web design, photography and creative writing. Work with local artists using animation, graphic design, web design, photography. Workshops 4-6 pm, Thursdays (ongoing) at El Colegio Charter School. • INDY: Write, direct, and produce your own independent film! Learn to create your own short films. Training includes film history as well as technical and artistic filmmaking skills. Each semester culminates in a public screening of your work. No prior skills or experience necessary. Workshops take place 4-6:30 pm, Fridays (ongoing) at Intermedia Arts, 2822 Lyndale Ave S., Minneapolis. Workshops are free but youth should register due to space limitation. For info, call 612-871-4444. The National Native Artist Exchange provides travel grants for Native artists residing in any of the 50 States. Designed to provide an opportunity for Native artists to teach, learn, and collaborate in traditional and/or contemporary Native art forms through travel. Grants up to $1,500 will be awarded based on budgets appropriate to the scope of travel. Deadline ongoing. Requests must be received no later than two months prior to the departure. For info see: www.nefa.org/grantprog/ nativearts/nativeartistexchange.html. New Fitness Program at the YWCA of Minneapolis. Reduce the Risk of Diabetes for Native Youth for ages 12-17. The Strong, Fast, Fit program works with youth and their families to teach and encourage life long fitness and nutrition strategies. Families who qualify receive a household Fitness membership! FMI, call Betty Moore 612-215-4367. A nationally-recognized pilot project that gives families who live in Frogtown and North End information and scholarships to help them choose, pay for, and stay in high-quality child care and early education programs. The child can begin to receive a scholarship for quality early childhood education at 3-years old. Multiple children per family can enroll. For application, call Resources for Child Caring at 651-641-6604. Provides publicly-funded allowances for parents to purchase early care and education services that will help their children prepare for school. Those eligible for the program are children who are 3 or 4 years old or will be 3 or 4 years old on or before September 1 of the current year, children whose families live in Saint Paul, and children whose families have an annual income at/or below 185% of poverty, ($39,000 for a family of four). U.S citizens or legal immigrants only. FMI call Resources for Child Caring at 651-641-6604. The Strong, Fast, Fit program works with youth and their families to teach and encourage life long fitness and nutrition strategies. Exercise and nutrition programming twice a week for youth; Monthly family nutrition education and classes; Fitness assessments; Quarterly field trips and athletic events for participants; training for track, swimming, soccer, triathlons and other sports. Families who qualify receive family YWCA membership! FMI: Betty Moore at 612-215-4367. Greenwood Press invites scholars of Native American history to submit entries for its publication titled Native America: A State-by-State History. Will cover North American Indian history in the United States from the pre-colonial period to the present. Interested authors should submit a CV noting their credentials and expertise as well as the name of the state(s) on which they would like to submit chapters. Each author will receive an honorarium for their contribution, and possibly a complimentary copy of the set. Send all inquiries to: nasbsh@gmail.com. Or mail to: Native America: A State-by-State History, Daniel S. Murphree, Associate Professor of History, University of TX at Tyler, 3900 University Blvd, Tyler, TX 75799. Capstone Publishers in Mankato, Minnesota creates nonfiction books for struggling readers. They are looking for non-Caucasian children and adults for upcoming photo shoots. Photo shoots take typically 30 to 60 minutes. They offer payment, copies of the book, and use of the images as incentive. For more information call Marcy Morin Photo Studio at 507-385-8279 or 1-888-293-2609, ext. 279. Capstone Press, 151 Good Counsel Drive, Mankato, MN. We are proud to offer two all-day preschool classrooms at Anishinabe Academy. Both feature Native Language Immersion programs in the afternoon; one in Ojibwe and the other in Dakota. We have space for 20 students in each classroom. Help us keep the vitality and focus of this special program by filling the classes with Native students and families who want to learn the languages. For info on enrolling your child for the 2009-2010 school year, call the Minneapolis Public Schools Student Placement at 612-668-1821.